In one of the premier Fifth Avenue cooperatives, this impeccable 7 into 5 room apartment features a stunning renovation with a gracious modern layout. The sophisticated living room with sun flooded southern views includes a wood-burning fireplace with a custom designed mantle. The bedroom wing features a spacious master bedroom with en-suite bath and second bedroom with a full bath off of a charming hallway. 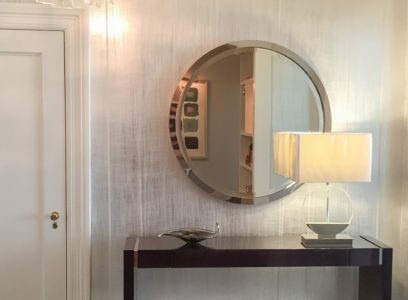 With not a detail left undone where Pre-War elegance meets modern art throughout, the two beautifully renovated full baths and Powder Room include Calcutta gold marble, nickel fittings and customized wall coverings. The library includes an exquisite built-in floor to ceiling bookcase and the large, windowed eat-in kitchen incorporates custom cabinetry, Sub-zero appliances and Caesarstone finishes. © 2019 Capital Craftsmen. Contractors of Distinction.